Much like stripes, I also have a soft spot for spots. And when I say spots, I am not talking about polkadots, but more like swiss dots or irregular spots... like these awesome Soludos calf hair espadrilles! They are seriously awesome and incredibly comfortable! I took them out for a walk last weekend along with this lovely blush pink trench vest, zippered bodysuit, and high waisted denim shorts. So, there you have it... an easy breezy Sunday look! Calf hair original spots espadrilles c/o Soludos. Blush pink trench vest c/o WearAll. High waisted denim shorts by JustUSA. 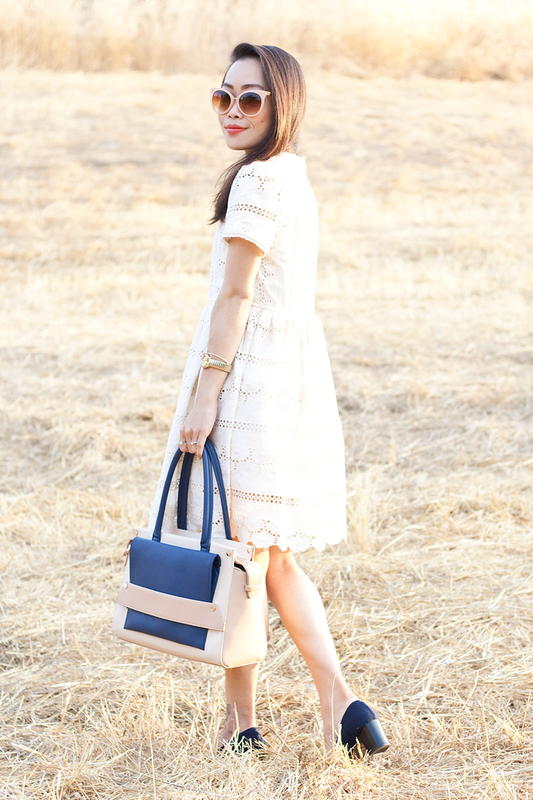 Ellis leather and canvas tote c/o Graf & Lantz. 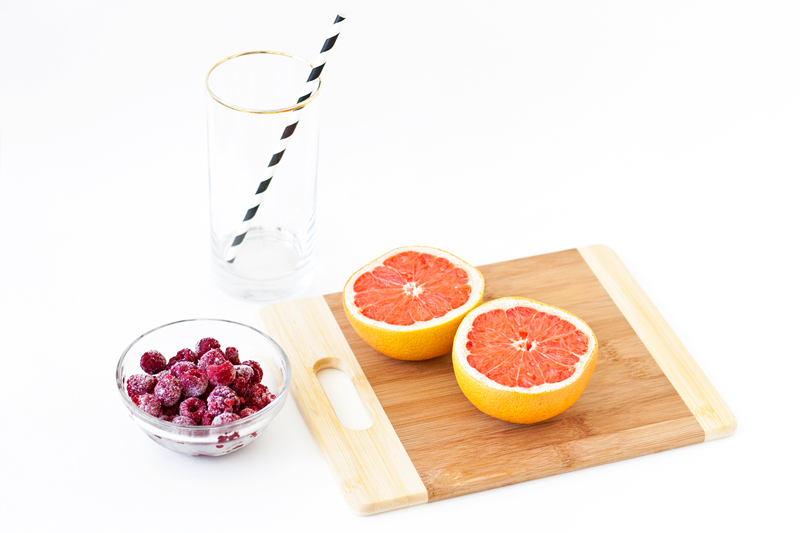 You are probably thinking, "Grapefruit AND raspberries? Tart on tart! How would that taste good?" Those were my exact thoughts when I first heard about this smoothie. 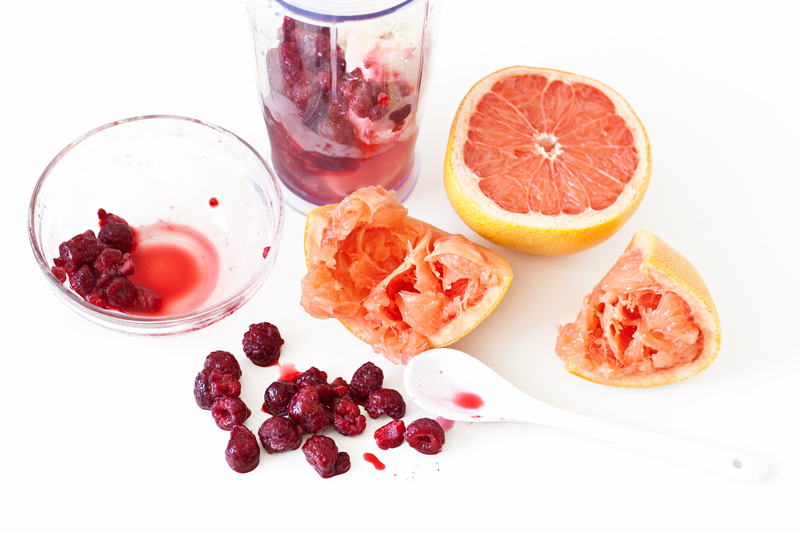 But since I love grapefruit and I love raspberries, I decided to give it a try and it is unbelievable!!! 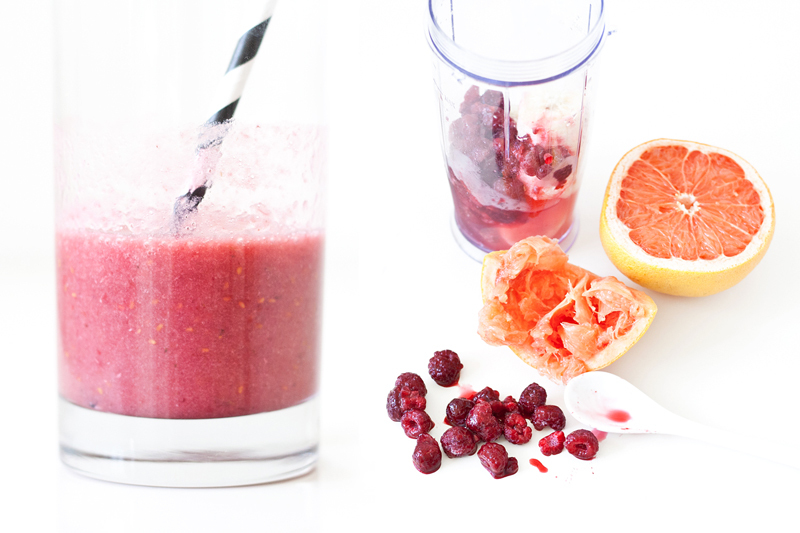 I am not exaggerating, this is by far the easiest (only 3 ingredients) and the most delicious smoothie I have ever had! There is nothing tart or sour or bitter about it, it is just pure deliciousness. 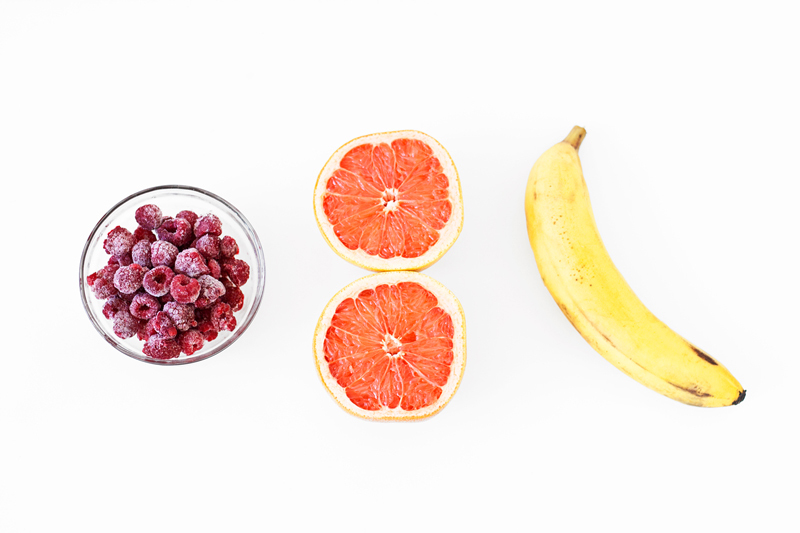 The grapefruit and raspberries compliment each other very well and the banana really offsets the tartness in both of those fruits. You MUST try it, it is SOOO GOOD! 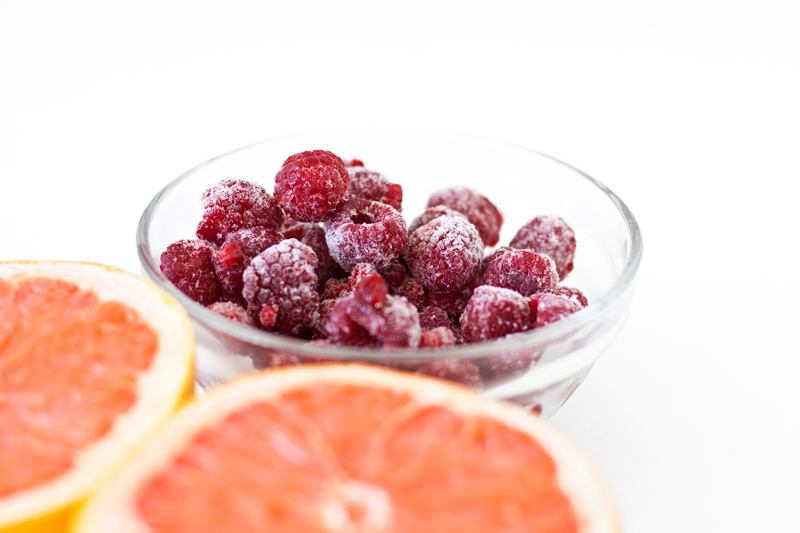 Blend together the grapefruit juice, frozen raspberries (you can use fresh ones but I like the coldness and texture of the frozen ones), and bananas until smooth. Simple as that! Now, drink up! Mixed stitch blanket cardigan sweater (sold out but similar here, here, and here) c/o Charlotte Russe. Oversize scoop neck tank c/o Charlotte Russe. 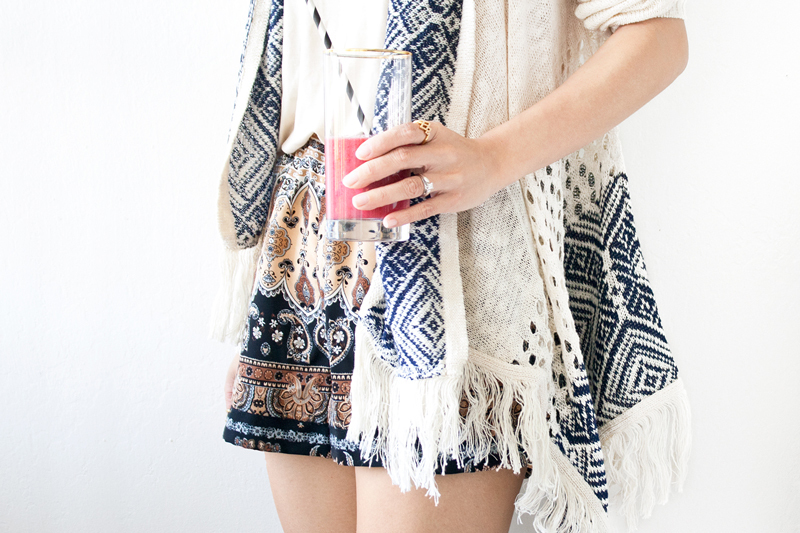 Paisley print shorts c/o Charlotte Russe. Photos - shot and edited by me. 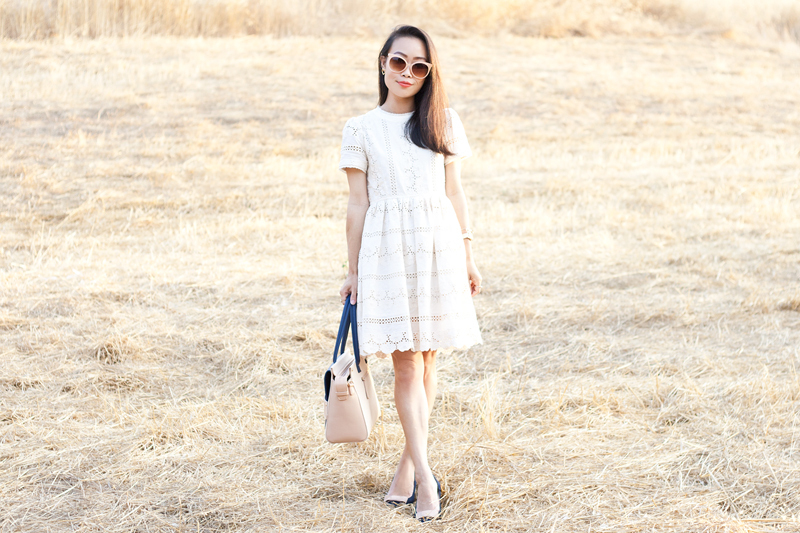 Been opting for tons of dresses that I can just throw on and don't have to think about it lately as we are getting this crazy heatwave here in the San Francisco Bay Area. 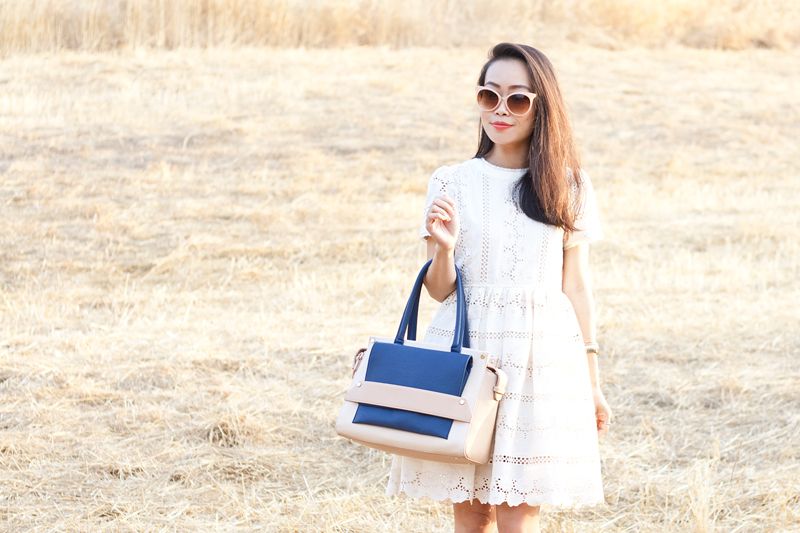 This dreamy little number I am wearing is perfect! 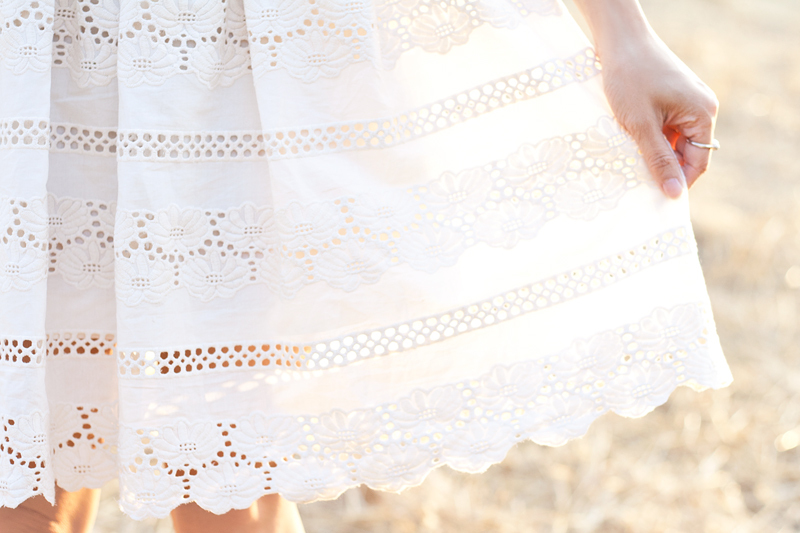 The babydoll silhouette is effortless and easy, and the crochet eyelet details is just absolutely beautiful! This look is a bit dreamy and a bit romantic... and I am totally loving how the goldenness of these images set the mood for later summer/early fall! 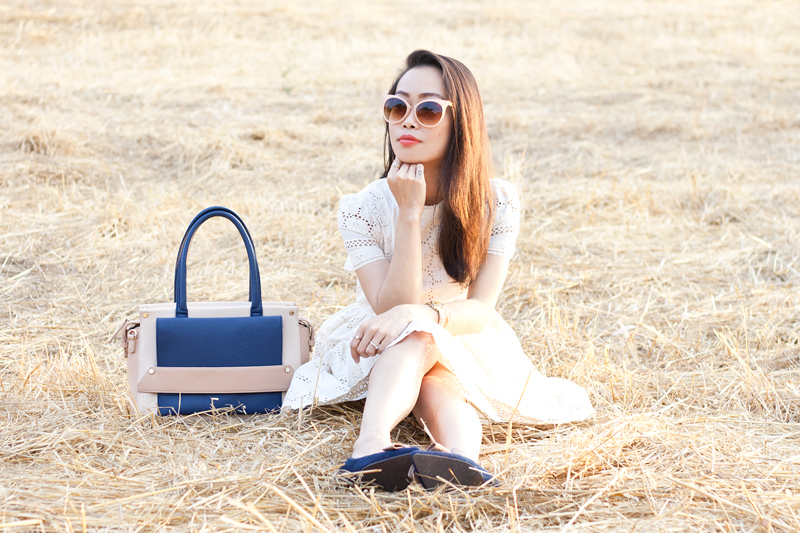 Crochet eyelet dress c/o Chicwish. 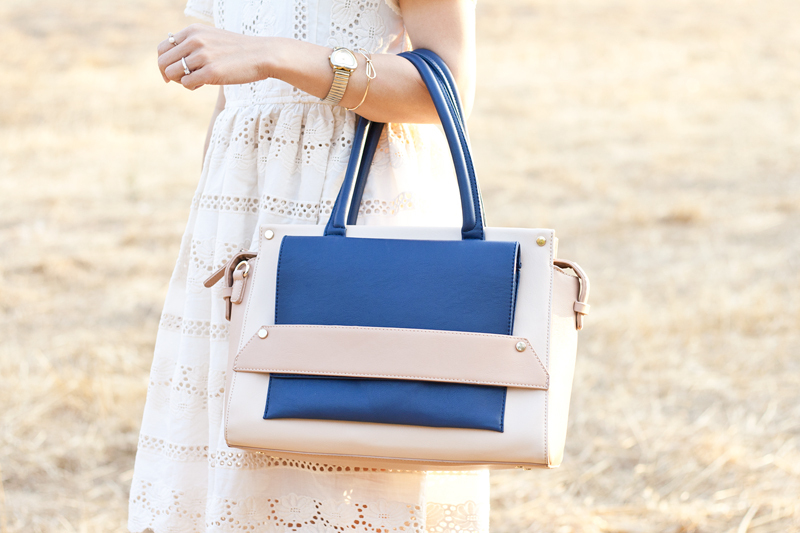 Everly colorblock satchel c/o Sole Society. 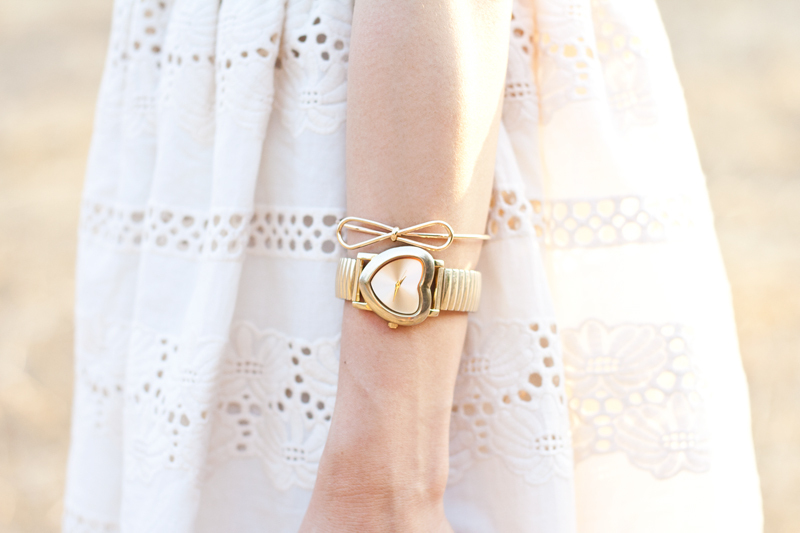 Dainty bow cuff c/o Sole Society. Navy Kelly bow heels c/o LeBunny Bleu. I don't know about you but I love monogramming! What I don't love is that getting something monogrammed or personalized usually comes with a price tag, so I thought... "Hey! I am gonna do it myself!" 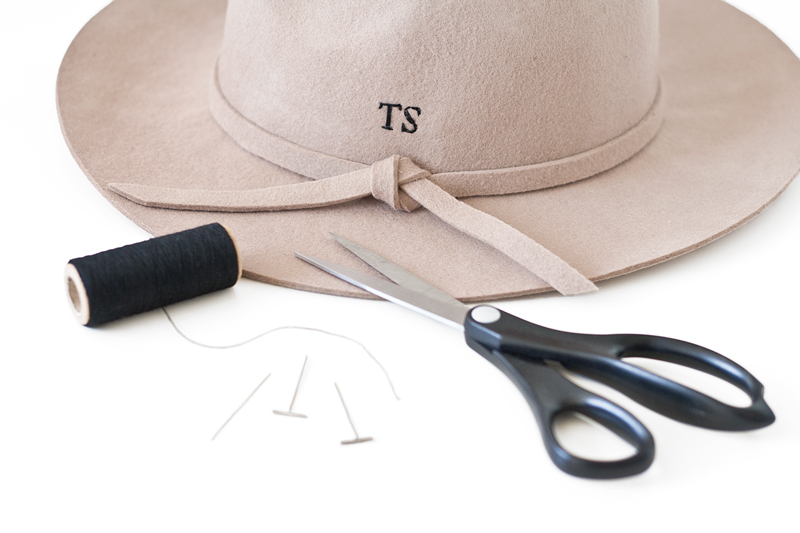 Don't worry if you are not sewing-savvy, this tutorial is actually fairly simple. 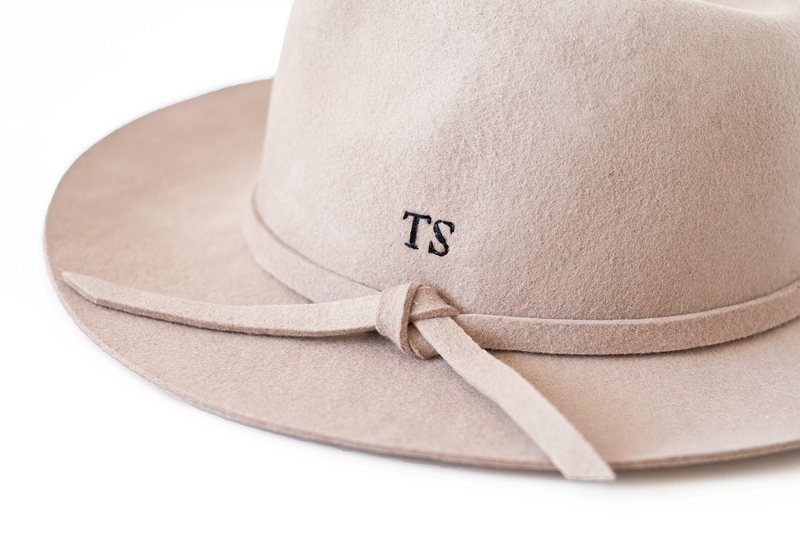 The only trick is not rushing through it and taking the time to embroider your initials. Slowly but surely, you will be amazed at the result! 1. 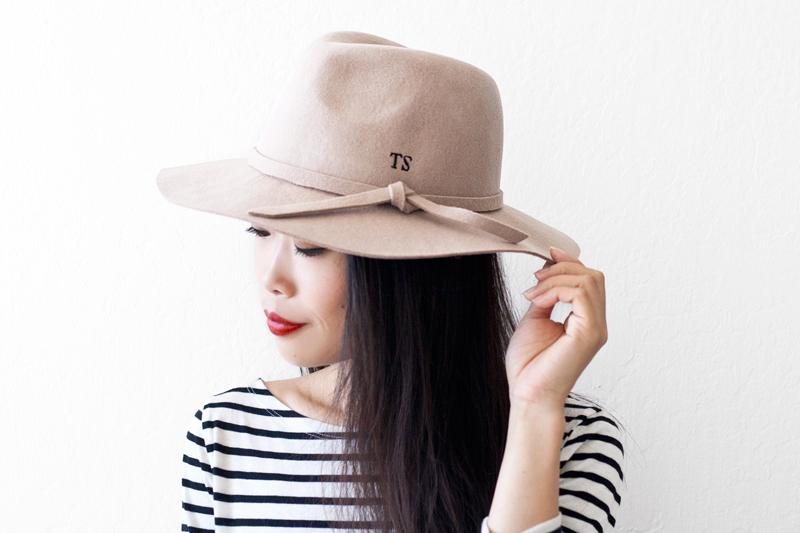 Grab a hat from your closet or get a new one! Love mine? Get it here. 2. Get on the computer and play around with your initials. Pick a few fonts and sizes you love, print them out! 3. 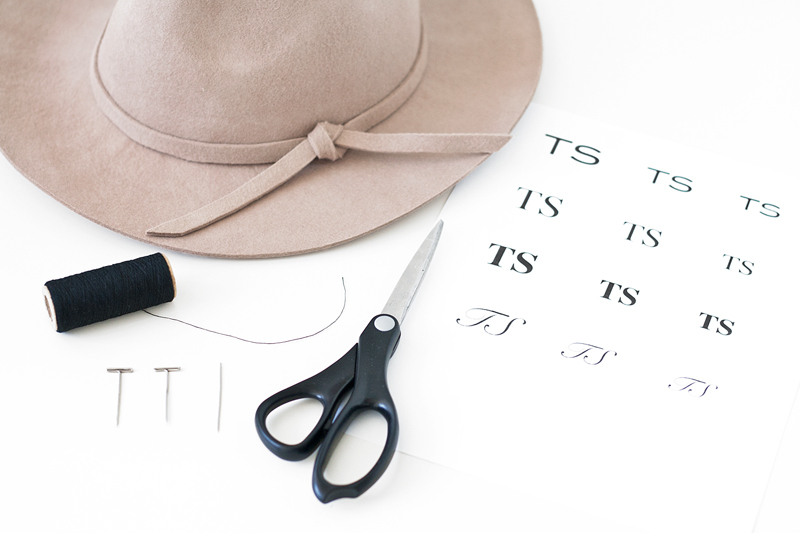 Once you have decided on the font and sizing, carefully placed the piece of paper with T-pins onto your desired spot. 4. 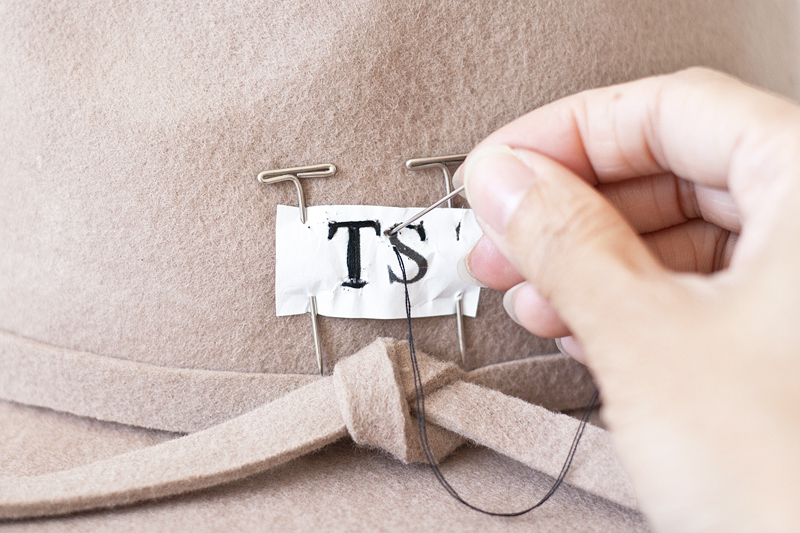 Carefully and slowly stitch up/embroider your initials over the piece of paper (you will remove it later) using thread and needle. 5. 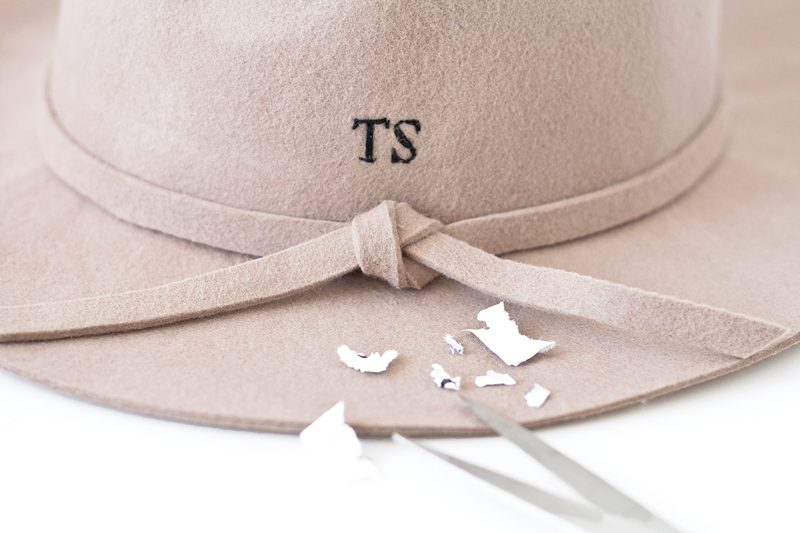 Remove the paper (a little bit at a time) with scissor. 7. Voila! 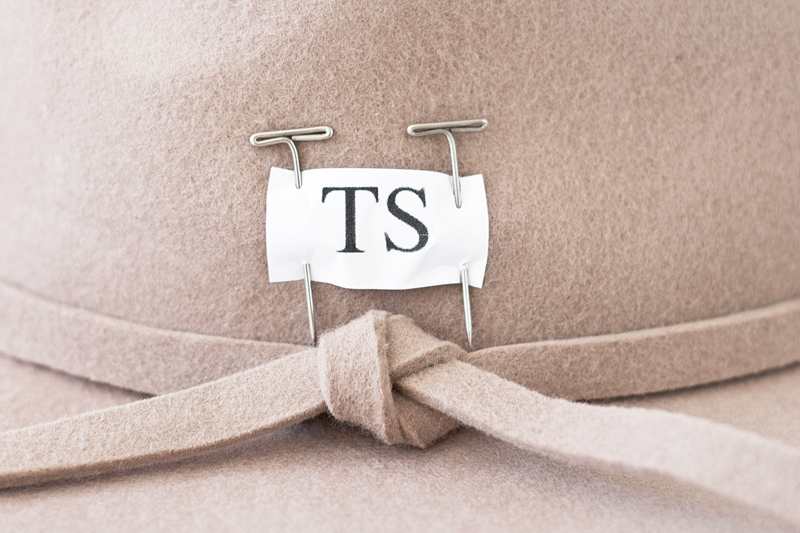 You've just done your own monogramming! It's quite interesting how my outfits differ on weekdays vs. weekend. I commute to SF from the Peninsula for work on weekdays so I layer up for the fog in the morning. I also tend to dress comfier and more casual since my job as a stylist require me to move around alot (handling wardrobe, standing on my tiptoes dressing models, and doing product lay-downs on my knees). Since I dress down for work, I like to doll up a bit on weekends. Last weekend was particularly warm and so I threw on this rather flowy ensemble... a crochet lace top, pleated chiffon shorts, and a gorgeous floral kimono. 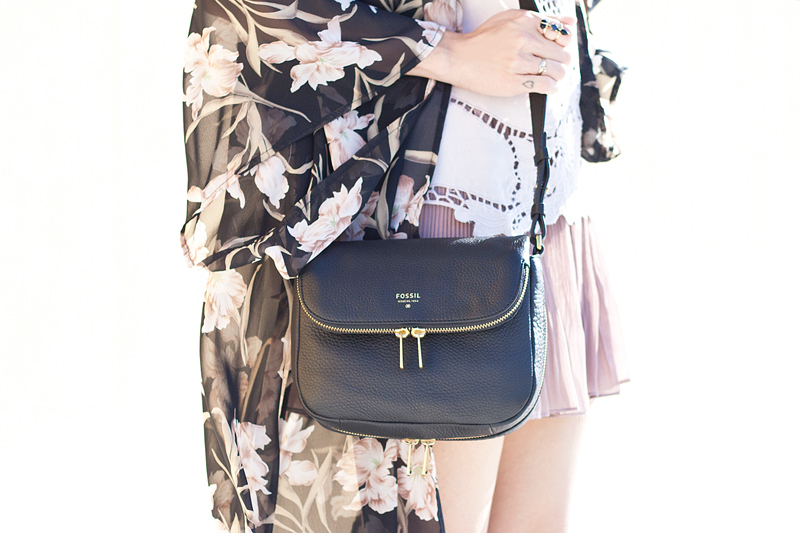 Thought I would add some black with a pair of heels and this versatile Fossil crossbody bag to offset the girliness. 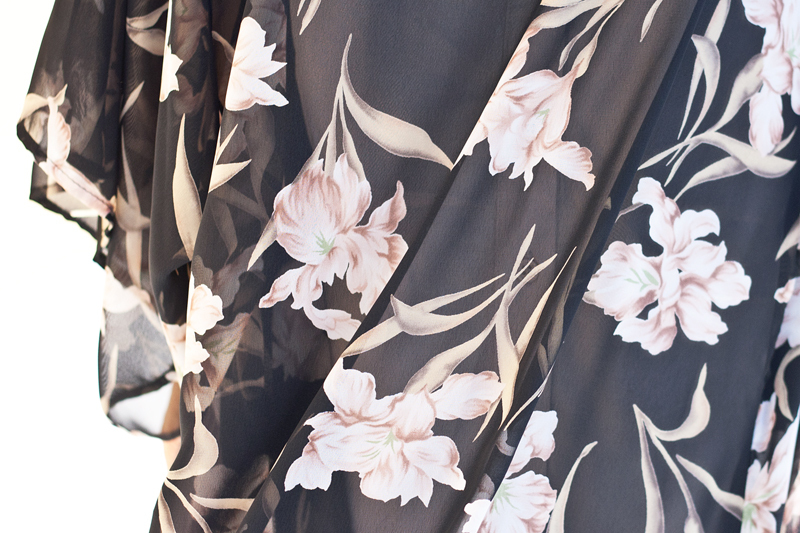 Floral kimono c/o Irene's Story. Crochet lace top c/o Irene's Story. 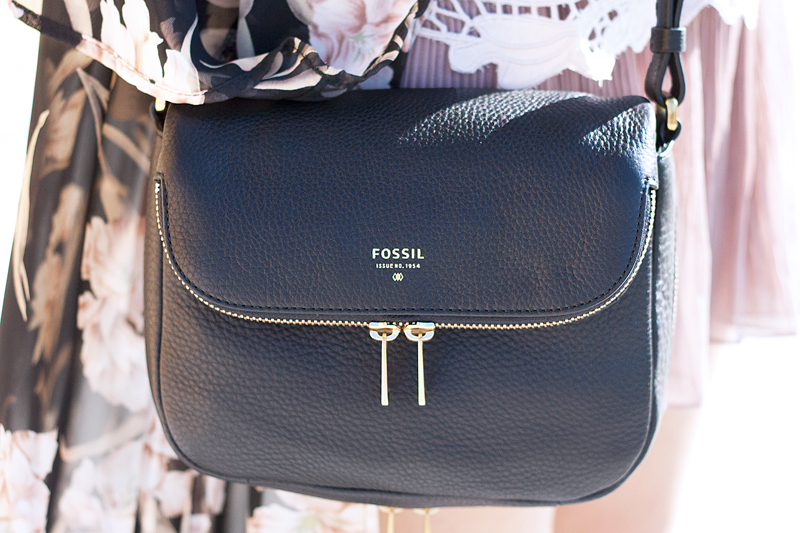 Preston crossbody bag c/o Fossil. Horses and hummingbirds ring in onyx c/o Samantha Wills. Black croc and suede heels (old). Although Fall styles are starting to pop up everywhere, knits and layering are the last things on my mind right now. 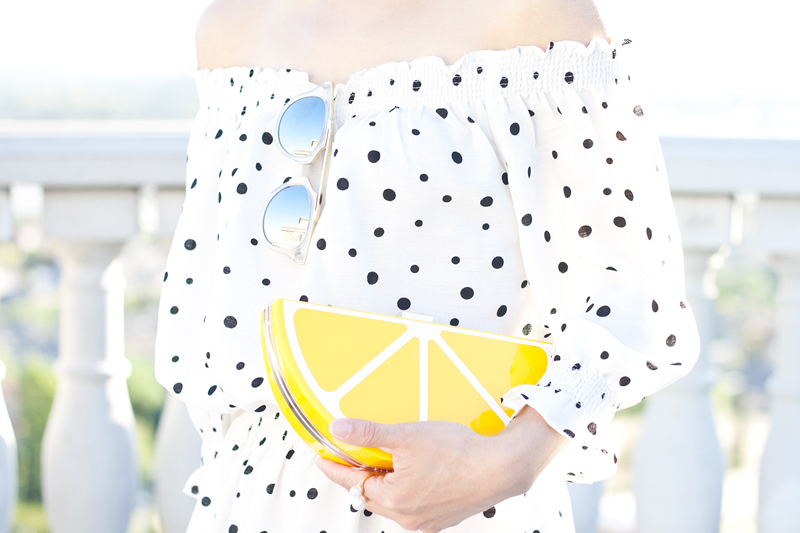 Summer is in full force and I am taking a slice of it (in the form of this awesome lemon wedge clutch) with me wherever I go. This clutch is so much fun and I love how it adds a pop of color to my black and white look... gold rimmed clear lens, statement tassel earrings, strappy heels, and this lovely dotted off-the-shoulder dress. 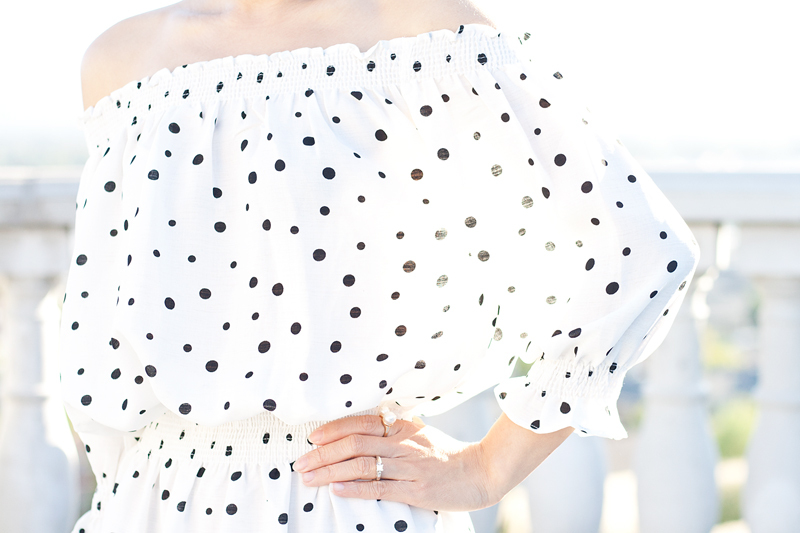 Dotted off-the-shoulder dress c/o Front Row Shop. 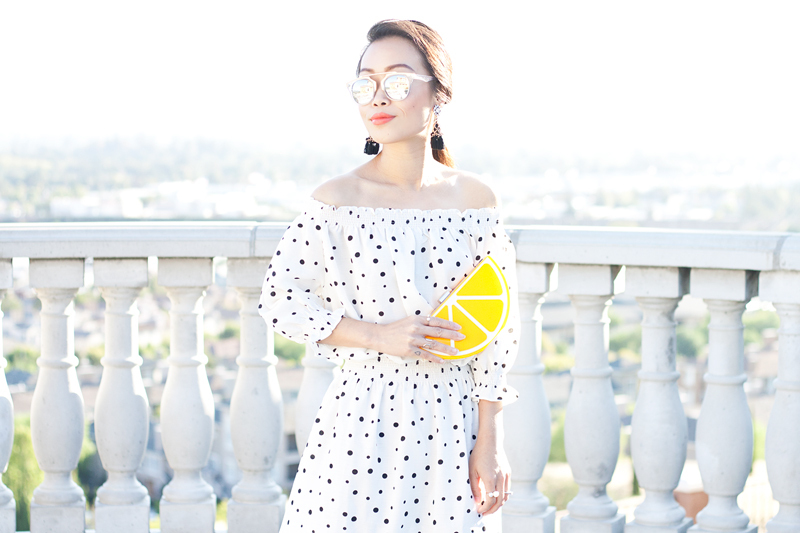 Lemon wedge clutch c/o Nila Anthony. Statement tassel earrings c/o Happiness Boutique.